Can ‘Airworld’ Truly Be the City of the Future? Business travel is in long-term decline. Rather than holding meetings at the Best Western in Kansas City, business has turned to teleconferences, Webinars, and facetime on Skype. IBM staffers conduct virtual-reality work meetings via Second Life, with avatars taking the place of people who’ve never actually seen each other. So who could believe that the City of the Future—and of the moment—is the “aerotropolis,” an urban development built with an airport at its center? It’s in such currently existing aerotropoli “where we can see how globalization will reshape our cities, lives, and culture,” says John Kasarda, a business professor at the University of North Carolina and the preeminent visionary of this trend. It sounds a bit like a Jules Verne-like fantasy, penned by some wannabe flyboy or coulda-been cosmonaut. But, no, it turns out: As Kasarda tells us in his new book Aerotropolis: The Way We’ll Live Next (Farrar, Straus & Giroux, $30), written with journalist Greg Lindsay, such places exist. One such real city is New Songdo, a metropolis built around an airport on a man-made, Korean island, just a two-hour flight away from China’s commercial, political, and manufacturing hubs. When Kasarda first began articulating his vision of such places, he referred to them as “global air-cargo-industrial complexes.” Imagine a runway lined with factories turning out iPods and computers, and you begin to get the idea. “A large and growing proportion of these goods moves internationally…by air either because there’s an emergency, because it’s too valuable to sit in a warehouse, or because it’s perishable, like flowers, fish, and pharmaceuticals,” he explains. China, which Kasarda says intends to double-down on its export-led economic strategy, has plans to move its coastal manufacturing cities inland, to new cities built around a hundred new airports. The authors’ paradigm is even sufficiently elastic to include the part of Memphis, Tennessee inhabited by the city’s airport and mammoth Federal Express facility. In 2008, researchers discovered that FedEx was “indirectly responsible for nearly half of the local economy,” the authors say, and for one out of every three jobs in the region. Memphis is “America’s Aerotropolis,” according to the town’s chamber of commerce. Uh-oh. Did you notice the telltale use of the word “indirectly” above—as in George Steinbrenner won seven World Series, albeit indirectly? And did you notice the authors’ drawing upon chamber-of-commerce hype to back up their thesis? Does that make you worry that just maybe they are stretching this stuff a tad too far? Several U.S. cities are discussed in Aerotropolis, including Louisville, Dallas-Ft. Worth, Los Angeles, and Detroit. None of these seem to me to qualify as urban developments built with an airport at their center. But, the authors say, such places wish they were like that—or, perhaps, that they are beginning to evolve toward that model. Another odd touch: Kasarda is listed as the book’s primary author–but in the text, profiled as a subject and treated as a source. It seems clear that the book was really written by Lindsay, but that Kasarda got author credit since he had greater name recognition. Sloppy, that–and not very convincing. 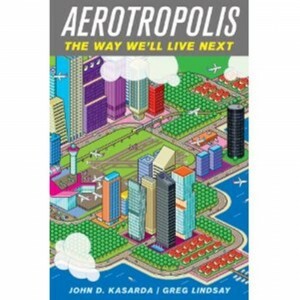 Nevertheless, even if Aerotropolis overstates its case and has other problems, it’s a provocative, unexpected volume that merits a broad readership and further discussion. Thank you for the final clauses, although how you arrived at that supportive conclusion after the preceding paragraphs is beyond me. I am disappointed, however, as I thought you above all others would recognize Memphis and Louisville as modern-day company towns. The CEO of FedEx even has a hand in recruiting basketball players for the local university (so perhaps they are, as you suggest, in the tank). Its impact on the city is beyond dispute, however. And Louisville used eminent domain to displace thousands of residents on the off chance UPS might want to expand. The mayor himself insisted UPS was central to the local economy — whether the airfield is in the center of town is sort of beside the point. I very much hope you’ll give it another read. I am wondering if you all feel that the seemingly endless trend toward high transporation costs could bring us back to the days of a more localized economy with less emphasis on big business and global expansion. Albeit somewhat reluctantly, have heard that some companies are bringing production back to the US because of this. And after being warned about our relentless dependence on foreign oil, will we finally get smart and reduce our dependency on oil and autos both? We obviously did not heed those warnings at the time. And how about the unrest in Wisconsin which has to some extent spread across the nation? Three decades after Reagan’s busting of the unions, is union activism and labor activism in general now back in vogue? Up until now it has appeared as though very little of the progressive agenda Obama touted in his campaign has materialized. For the past three decades in particular it seems as if we have proclaimed Corporate America to be the modern-day equivalent of the Golden Calf of Moses’ day, like a god virtually untouchable. Hope some of this begins to change now. Perhaps you read the recent article in Wired about how some manufacturers are returning to the US due to ineffiencies/quality failures in Chinese manufacturing and to high shipping costs. Here, moreover, they can use more robots rather than depending on human workers. That’s my only comment.